I’m not a soup person. That being said, there are a handful of soups that I really love, including lobster bisque and butternut squash soup. We’ve made butternut squash soup before, but this recipe seemed to be an interesting variation, including apple (and apple cider) along with smoked cheddar–and I’m definitely not one to pass up adding cheese to something. In a large saucepan, heat the olive oil. Add the onion and cook over moderately high heat, stirring occasionally, until golden, about 8 minutes. Add the apple cider and cook until syrupy, about 3 minutes. Add the butternut squash and chicken stock and bring to a boil. Cover and simmer until the squash is very tender, about 40 minutes. In a blender, puree the soup in batches. Return the soup to the saucepan and stir in the cream. Season with salt and pepper and keep warm. Heat a medium skillet. Add the butter and diced apple and cook over medium-high heat until the apple is tender and golden around the edges, about 2 minutes. Remove the skillet from the heat. Season lightly with salt and pepper. Ladle the soup into warmed bowl; garnish with the smoked cheddar, sautéed apples and chives; serve. A few notes on preparation: Instead of chives, David fried up some bacon and used that as a garnish (though they did sink, and ended up being a bacon surprise). I was pretty stoked at how delicious the soup turned out. 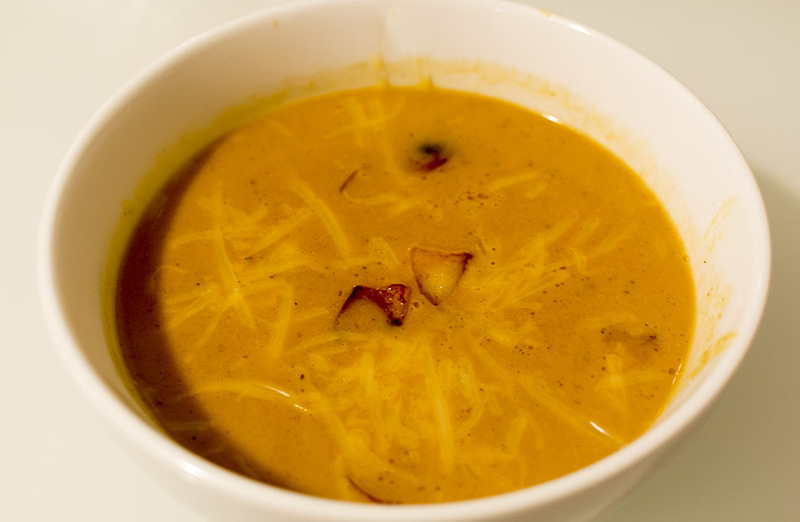 A classically rich and flavourful soup, but the apples added a nice touch of sweetness. The cheese (of which I liberally added more) was also a great addition, smoky and creamy. A great deal on chicken led David to making some homemade chicken stock, using most of a chicken (everything but the breasts), so the stock was particularly rich, which David noted definitely helped elevate the soup. The bacon was a fun addition (like a deliciously salty toy surprise! ).